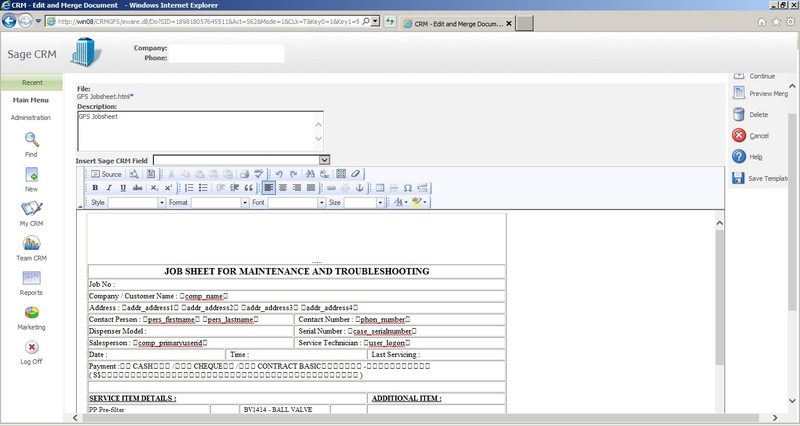 We're currently customizing a mail merge document for our customer who's using CRM Version 7.2a patch 1. 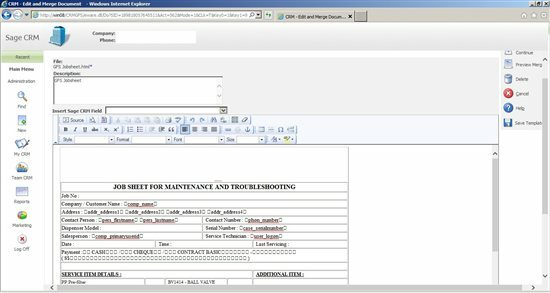 After we add in new merge document (HTML format) and edit the same attachment again in Administration -> E-mail and Documents -> Document Templates, and re-select the merged document from within Company entity, the merge field's << and >> symbols become square boxes. Attached is the figure which shows the problem. Blank spaces at "Payment" in figure below also shows square boxes. Why is that so? For your information, when editing the attachment, we're inserting the merge fields from Insert -> Quick Parts -> Field -> Mergefield -> column name in Ms Office 2013. I have seen this as well. I believe the answer to your question is whatever you are using to edit is replacing the laquo; and raquo; tags with the equivalent of << and >> which shows up as a box. I had to open the template with a text editor and manually replace the << and >> with the laquo and raquo tags. There should be a & in front of laquo; and raquo; I find the CRM built in interface for editing HTML damn near worthless except for the very simplest of Documents. And since the Word based email templates are screwed up royally by the new server side paradigm you basically don't have a choice but using HTML. I would get a good HTML editor and do all your editing there. For on premise CRM the files are located in Library\Global Templates\CC where CC = Country Code. Hi there - here are some articles that will help you get to grips with the changes that have been made to the mail merge process since 7.1 SP2. I understand that it has not been an easy transition, especially for those customers who use quite complex mail merge templates. However, we are constantly monitoring the situation and do our best to help where we can by offering advice on how best to format templates - or recreate them where possible. Please feel free to contact me directly if you experience any further problems. I had the same effect, I followed the exact steps for replacing the >> with » etc. and the template, when viewed in text editor in CRM, displayed as squares. I also added fields in the text editor and the added fields appear with the >> symbols. Either way, I thought I would see what the merge looks like. None of the fields merged. They all appeared in the merged document exactly as they appeared in the editor. I decided to try creating a very simple test template from scratch, within the CRM text editor. I added a few basic opportunity fields and, once again, when I merged the template, the result did not merge the fields but displayed them exactly as they appeared in the editor. For example, <<oppo_description>>. As a test, I created a similar template in the company context and it worked perfectly when merged. It appears that there is a fundamental problem with merging in the opportunity context.